Professions in most MMOs such as Weaponsmith, Alchemist, etc. are pre-defined from the beginning. In keeping with our existing classless design principles, Chronicles of Elyria doesn't define specific professions. Instead, it encourages players to take skills from across different skill trees and combine them in unique ways in order to define their own professions. As an example, if you're a Blacksmith with a specialty in making weapon blades, that also has skills in carpentry, and maybe in filigree, then you could rightly call yourself a Swordsmith. This level of specialization allows you to reach the higher crafting tiers in the areas you want, while ignoring those that you don't. In this week’s design journal we’re going to talk about how Chronicles of Elyria reduces the barrier to entering new crafting professions and allows you to be a Producer from the start. We’ll also talk about the unique elements of crafting skills such as skill challenges, item specialization, component-based construction, and how we deal with non-renewable resources. One of the problems you encounter in most MMOs is the inability get started with a crafting skill or profession. You want to a blacksmith? Great. But that requires money to buy resources, tools, and crafting supplies. In most MMOs this requires you to head out into the fields to kill a few bunnies, gain some coin, and then come back and sell off the vendor trash before you have enough money to do what you want to do. In CoE, thanks to the power of contracts, we've mitigated this problem by offering apprenticeships and loans. Most villages or towns will have a resident expert in a specific crafting skill. If you go to them, they may be willing to offer you an apprenticeship. This will result in them providing you tasks that will help you develop the skills you need to improve. And, because they're getting free labor from you, they'll cover the supply costs for you. Once you move from Apprentice to Journeyman, many of them will even be willing to pay you for your service. Finally, reaching the rank of Expert in a crafting or gathering profession will usually result in NPC loan agents being willing to grant you a loan to set up a small operation. They'll take everything you own as collateral, of course, but it means you can start your small business with nothing but your wits and dedication. As well, PC's may be willing to sign a loan contract even earlier than that if they trust your ability to pull a profit. But what really determines your crafting ability? Character skill? Player skill? Both! The game breaks skills down into two fundamental categories: Combat Skills & Non-Combat skills. Regardless of the larger category all skills in Chronicles of Elyria require some degree of player skill. In the case of combat skills it's fairly obvious how character skill and player skill intermix. Timing, reflexes, and intuition have long been staples in traditional fighting games as well as aim based combat systems. Add onto that damage and reflex modifiers and you've got a hybrid combat system. With non-combat skills it's a little more complicated. With CoE, we really wanted a system that went beyond simple progress bars and instead engaged the player in the activity they were performing. As a result, we've developed a dozen or so "Skill Challenges" which provide players an opportunity to demonstrate their capabilities within the specific skillset. As an example, see Figure 2. 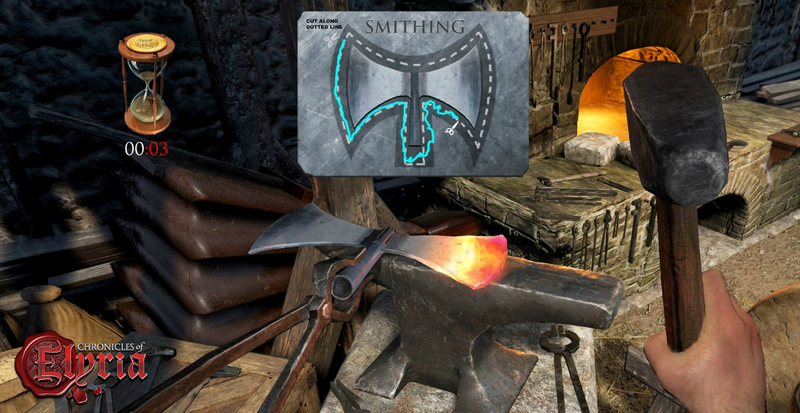 In the Figure you can see a simple Blacksmithing Skill Challenge. Here, the player is required to cut out the shape of the axe blade they are trying to create. While it might not look like much, there's a couple things happening that may not be obvious. First, the more complicated the object, the more complicated the shape the player must cut out. Second, the higher the absolute difficulty of the object, the less time the player has to cut it out. Third, the larger the difference between the character's skill and the skill of the item, the wider or narrow the margin of error. What's the end result? The better you are as a player, the more likely you are to attain higher character skill-levels. It should also be noted that several challenge types will be used across different crafting types. For example, blacksmithing, leather-working, and tailoring all use the stencil challenge shown in Figure 2. In addition to the Stencil Challenge shown above we've got a dozen other challenges planned which will be used with different shared skill sets. We're looking at a musical, Guitar-Hero style challenge for musical skills, "find the item" type challenges for Tracking and other related skills, whack-a-mole type challenges for other smithy related tasks, and even "operation" style problems for first-aid! Want to remove the spear-head from your allies' wound? Don't touch the sides! One thing we've done in an attempt to prevent endless grinding is to, in the case of crafting, provide item specialization. This means that you can become a master of crafting specific items, even before becoming a master at your specific craft or trade. This has to two fundamental implications. It means that if you want to become a master weapon smith, able to create Sword blades that are unparalleled in the land, you can do that simply by crafting sword blades. You don't have to craft metal tools, axe blades, or metal steaks in order to get your blacksmithing skills high enough. Spend your time focusing on the things you want to make. As we'll talk about more in a later design journal, CoE is a game of technology and research. At some point in the future someone may (hypothetically speaking) discover the ability to make longbows, recurve bows, and eventually compound bows. In other MMOs, the discovery of a recurve bow would force all new players to grind through knowledge of how to make short bows and long bows just to learn how to make a recurve bow. This results in wasted time, and wasted resources. In Chronicles of Elyria, if you were to discover or learn how to make Recurve Bows, your success in doing so would of course be influenced by your overall Crafting Skills in Ranged Weapons and Carpentry, however there's nothing preventing you from jumping straight to Recurve bows and growing your skills on those. Of course, your early results may be horrible, but you'll advance quicker at developing recurve bows if you actually practice making recurve bows, than if you were to practice making short bows. As with many other MMOs, Chronicles of Elyria allows the transfer of knowledge, specifically in the crafting skills, through recipes. Having a recipe and being able to read the language, grants you the knowledge necessary to attempt to craft something. If you also have sufficient skill you'll be able to reproduce the item. Unlike other MMOs there's a synergy between crafting and the Scribing skills, as those who have sufficient Bardic skill can create their own recipes to give to others in order to share the knowledge. Chronicles of Elyria utilizes a component-based crafting model that both encourages collaboration and also allows Producers to specialize in the types of objects they want to create. If you want to create a sword, you'll need a couple different components. In specific, you'll need the blade and the hilt, the latter being made up of a handle, a cross-guard, and a pommel. The handle again being made up of a wooden handle and some kind of binding. As you assemble the final product, you'll have the opportunity to swap out components for higher or lower quality components as desired. And sometime, changing the type of component, such as changing from a straight blade to a curved blade, can even change the type of item you're creating and lead to the discovery of new recipes or patterns. 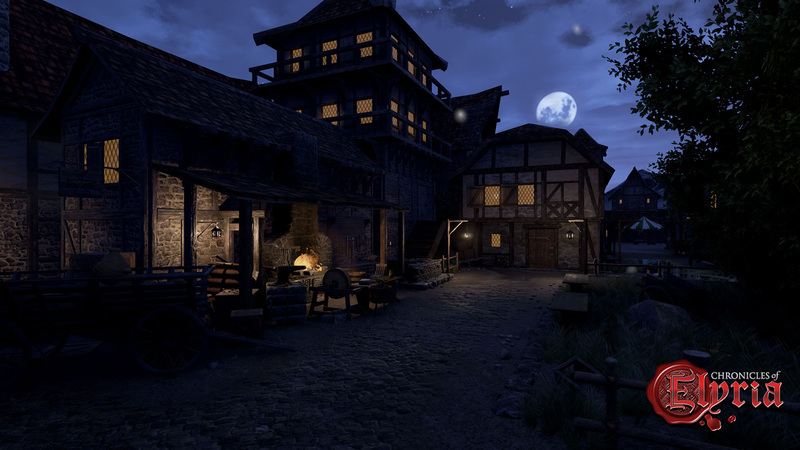 Chronicles of Elyria also uses the concept of progressive construction or "value added". This means it's possible to take a simple item, either assembled or unassembled and make it progressively better by adding onto it. For example, you can take any standard blade and add a blood groove to it to make it lighter. You can also take any existing blade and add filigree, etching, or even serration. In all of the above cases the raw materials are processed by a Gathering skill to turn them into something consumable by different crafting professions. For example, those with the Mining skill are able to gather raw metals and then convert them into smelted ingots. Those with the mining skill can also use the Jewel cutting skill to take gems from metal deposits and cut them into jewels for use by jewelers. In Chronicles of Elyria, the majority of crafted objects which require assembly can also be disassembled. There's a couple reasons you might want to do this. First, if you decide later you want a better hilt on your sword, you can take it apart, put a better hilt on it and you're good to go. This applies to the component level as well. Don't like the ruby on the pommel of your sword? Take it off and put the shiny new sapphire on. Second, many items in CoE suffer durability loss over time. While it's possible to take the blade you've been using to a grinding wheel and put a good edge back on it, that'll only work so many times. At some point, it'll be necessary to get rid of the blade entirely and put a new one on it. One of the major problems in most MMOs is the need for a money sink. This sink is necessary because resources are unlimited. Metal deposits are constantly appearing as new resource nodes, animals are always respawning, and NPC villains forever roam the land with wealth that materialized out of thin air. Most MMOs handle this problem, among other ways, by having resources destroyed during crafting. This is true whether you’re successful or unsuccessful. If you fail a skill check, you may lose some percent of the resources in addition to failing to create the item. If you succeed, you may get the item but the resources are still gone forever. However, Chronicles of Elyria is a world with finite resources. Metals, gems, and other non-renewable resources can become extremely valuable as the game evolves. As a result, we’ve instituted a mechanic for recycling. Many materials, such as metals can be disassembled from their current object, such as taking a blade off a sword, and can be re-melted into ingots at a forge. In this way, many materials can be put to new use. Rather than forcing you to sell the blade you just found to an NPC as "vendor trash", you can instead take the bad blade, put it back in the forge, and recoup most of the metal used in the initial crafting. In this way, you can continue to craft an item, advancing your skill, until you create a product at the quality you're looking for. This week’s design journals focused on skills, skill advancement, crafting and professions. Next week we’re going to do a deep-dive into a specific set of survival skills to learn more about maps, cartography, and navigation! You can look at our own history and see the Migration of miners, gatherers, etc over time. The Western USA for example is littered with played out mines and the Boom towns that grew up around them. So as an explorer you would want to stay a step or two ahead of the mining operations in finding new areas to open the next mine. You could then sell these locations to the local noble and move on to the next area. Doing so would likely help you gain a reputation and possible contracts from Nobles to search for such mines for them. All awesome stuff, very exciting! One small but important point: The grooves on sword blades are called fullers not blood grooves, please, please don't call them blood grooves, it makes anyone who actually knows about swords cringe! There is no such thing as a blood groove, fullers have nothing to do with blood and are there simply to reduce the weight of a blade without compromising its strength giving a faster, more balanced sword. You know how im MMORPG's they got those swords with blood encased in the grooves. yea. I really hope it's largely skill-based when it comes to professions. Like with taming animals. I want to actually have to woo or dominate the animal I'm trying to tame. I want there to be a lot factors in skills so that seeing a master/expert of a skill lets a player know that, that player truly is skilled, and doesn't just have a lot of grind-time on their hands. "For example, you can take any standard blade and add a blood groove to it to make it lighter".. my body actually twitched when I read the term "blood groove". It's called a fuller and it's used to reduce the amount of material required for a blade, and create lateral strength by introducing a curved surface on the inside. Ah, someone got there first, thank goodness! I am... interested to see how resource entropy (finite resources being exhausted over an extended period) will affect the game over time. How long would it be expected to take for a world to run out of a specific resource? What would occur at the end of a resource's lifespan in a world to satisfy its demand? I am also curious: Will resources that are discarded disappear, or be dropped as a collectible item in the world? Will this game's realm have dumps? Scavengers? Material recycling could have a lot more depth with this kind of mechanic in play, though the server burden might be too much for it to be viable. I am... interested to see how resource entropy (finite resources being exhausted over an extended period) will affect the game over time. How long would it be expected to take for a world to run out of a specific resource? What would occur at the end of a resource's lifespan in a world to satisfy its demand? I am also curious: Will resources that are discarded disappear, or be dropped as a collectible item in the world? Will this game's realm have dumps? Scavengers? Material recycling could have a lot more depth with this kind of mechanic in play, though the server burden might be too much for it to be viable. I Hope there will be medical professions, something that not going into witchcraft and potions made from toad eyeballs (that can be a different branch), but mixtures that can numb the pain, the use of letches, and tunicates. Being able to do autopsy, create medicine that can cure/tame illness. Medical Research? An illness can sweep the village. So, when we are gathering or crafting and such, if that is what we do is there a way to gain fame? Can't there be a legendary swordsmith in legends, or people/regions/families who are famous for producing high quality materials? It would be nice to have a reward system for the top crafters, gatherers etc. Gathering I suppose would be harder die to conflict over materials but it is an idea. Does that mean I can run a chop shop by stealing weapons, disassembling them, reassembling them slightly differently, and selling them as my own? Hm.. This really makes one think about what path their character would go down upon. I noticed that you mentioned research and technology. Does that mean that you could, in theory, create a weapon type not in the game at that moment? I like the Skill Challenge idea. For more academic skills like alchemy and scribing there should be skill challenges that require more thinking skills, like having to remember and follow steps in a recipe or know the lore and effects of particular materials. For scribing tasks there could be skill challenges that involve identifying statements that employ the correct grammar, contain logical fallacies, or create loopholes. The absolutely best blacksmithing experience I've seen is in A Tale in the Desert. To make a hatchet, for example, you must select which tool you want to use (round hammer, shaping hammer, ball peen hammer, wide chisel) and the force (1 to 9) you are swinging it. The metal is deformed according to the type of tool and force, from the point at which you click. You get a limited number of hits (based on the quality of metal used), and can check your item's quality against the target goal (with item quality ranging from 0 to 10K). The system essentially mimics real-world physics for shaping metal, and players who can craft 9K+ items are in high demand. There's a great deal of pleasure in creating a good item, because you know it was all based on your knowledge of metal and your practiced skill. The Stencil Challenge sounds great (especially compared to the usual MMO model), but it would be great if it could even further. ETA: Actually, ATITD is a great model for crafting in general. It's a game for people who like spreadsheets (which means it may go too far for a game with a wider target audience), but there may be elements of it that could provide inspiration for CoE. The absolutely best blacksmithing experience I've seen is in A Tale in the Desert. To make a hatchet, for example, you must select which tool you want to use (round hammer, shaping hammer, ball peen hammer, wide chisel) and the force (1 to 9) you are swinging it. The metal is deformed according to the type of tool and force, from the point at which you click. You get a limited number of hits (based on the quality of metal used), and can check your item's quality against the target goal (with item quality ranging from 0 to 10K). The system essentially mimics real-world physics for shaping metal, and players who can craft 9K+ items are in high demand. There's a great deal of pleasure in creating a good item, because you know it was all based on your knowledge of metal and your practiced skill. The Stencil Challenge sounds great (especially compared to the usual MMO model), but it would be great if it could even further. ETA: Actually, ATITD is a great model for crafting in general. It's a game for people who like spreadsheets (which means it may go too far for a game with a wider target audience), but there may be elements of it that could provide inspiration for CoE. Way too complicated for me. It would literally mean that a vast majority of people like me who craft for functionality and because combat bored them are now too "casual" to even craft. That I feel would severely cripple the game. I literally wouldn't want to play. I'm just wondering if any sort of enchanting will be available in the game. For example if you were to be an expert swordsmith and wanted to increase the potential of a weapon and enchant it with runes or something else. Is this something that you're looking into? And if so, how? Is crafting still up for debate? Doing a simple "cutting" the outline of a weapon sounds a bit simple. Maybe make it so you have to see the weapon in the forge reach a certain temperature by looking at the color (bashing a button to shoot more air into the fire and taking it out when it's at the right temperature), have it taken out and have you hammer at it (charge up hammer hits to make the shape of it faster and have higher quality and the goal is to make it before it gets too brittle). Add a balancing minigame for grinding as well. Make that one single weapon worth a lot cuz of the time it takes to make it. I feel like if someone see those things as a chore, it's probably not the profession that they should get into. I feel like having that amount of complexity will make things more rewarding. Why can't this be out already, or at the very least let us practice making weapons, this looks like to much fun. These ideas are very much what I have wanted in an MMO. Coming from a D&D background MMO's even the D&D ones were just another game nothing substantial on an RPG side but this certainly looks much more immersive. when you hit legendary you should have to pay 5 dollers or less to get the pesific hardware to finetune your skills as a blacksmith or other professions for the mini games like using a pen or somthing to make the edge straighter thus getting a perfect legendary item imo just an idea. If all the trees are chopped down how will the players get the wood they need for building, weps, etc. Wood will obviously grow back, albeit slowly, using the game time would probably take a tree several hundred real time hours to grow from sapling to full height. Gems, rock, clay, etc will be finite though (they don't just grow) but come to think of it, gems and rock do grow from volcanoes so would just be a lot slower in game terms to renew and you would have to have a volcano spewing forth new minerals to the surface! The only thing I'm wondering about is if the fan base for the game grows, will the amount of materials available also grow to compensate? If not, things may run our fairly quickly. Since there is a finite amount of resources, can we as players loot the trash for items as well? Instead of tossed items vanishing or deleting, are they going to lay on the ground waiting for a crafter to come along for recycling? I love crafting and to do scrounging runs for materials would be an interesting twist on gathering. This! I would absolutely love this, considering how many times I threw trash around in Oblivion and Skyrim! lol. Some people could actually specialise in searching for and looting left over loot at the entrances of dungeons and caves. The recycling aspect is also very enticing, I like that nothing needs to go to waste. the whole taking apart a sword that you might not use anymore is an exciting feature i will personally enjoy. i am really excited for this game even more so now. Does this mean that eventually there will no longer be a need for people to go mining for ores if all of them in the server have already been gathered? Unlikely. But it does mean a particular mine might become tapped out. Regions that were once rich in ore may become barren, forcing exploration and a shifting of wealth to other regions. More amazing stuff. Can't wait to hear more. Very neat concept, with no renewable quests plus the fact that people won't be vendoring items this will heavily reduce the amount of currency that can just be materialized out of thin air. This might mitigate inflation and promote a bartering system instead of the normal currency for items system that most MMOs see. I hate nature. I would rather sell my my items as vendor trash then recycle! Mother Nature abandoned me to Mother Humanity. Mother Humanity once said "Humanity must rule nature with a iron grip, take and never give back."